The werewolf has animal power. She eats, she attacks, she rebels. She seduces, she hunts. She is anti-heroine and phantasm. As with witches, werewolfs were among the figures in the Middle Ages who were fantasized about stigmatizing and punishing single women, heretics, strays or people with non-compliant behavior and deviant sexuality as dangerous. Since then, the werewolf has become an archetype that marks the boundary between »civilized« and »wild«, human and animal, the norm and the other in cultural history. In BLUE MOON the mostly male connoted werewolf is appropriated and transferred into states of female monstrosity. 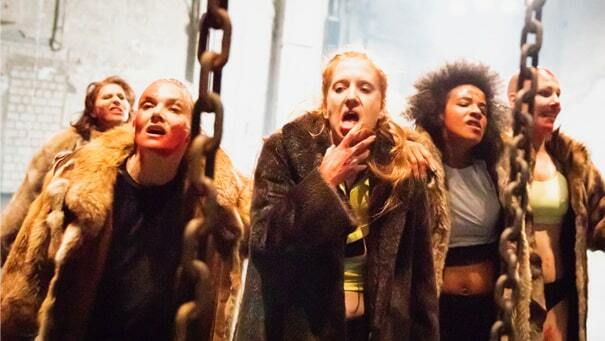 In a setting between torture chamber and slaughterhouse, the »gang« of the 5 performers goes through various stages: they become excessively sexual and beastly, they tell apparently innocent fairy tales or become judges about humanity. Sometimes they perform a cat walk, sometimes hooliganistic energy, sometimes they morph into a subjectless organism – escaping any unambiguousness and ambivalently shifting between post-human human animal and feminine cliché, between victim and perpetrator. The stage becomes an eerie biotope, in which movie quotes from horror and science fiction films. Representations of femininity and feminist orgiastic bodies are omnipresent. Performance in German and English. A production by Ursina Tossi in co-production with Kampnagel Hamburg and Tanzfaktur Cologne. Supported by the Hamburg Ministry of Culture and Media, the Hamburg Cultural Foundation, the North Rhine-Westphalia Art Foundation, the City of Cologne and the Ministry of Culture and Science North Rhine-Westphalia.